With avian flu outbreaks on the rise in Vietnam, and the festivals of the Lunar New Year just a couple of months away, the Vietnamese government is raising warnings over another potentially deadly food borne pathogen; Streptococcus suis. A Gram-positive bacterium, with 35 known serotypes - S suis represents a large and diverse species of bacteria – many of which are carried asymptomatically by healthy pigs. Serotypes 1-8 are most often associated with disease in pigs, and among humans, infection is most commonly by serotype 2. S suis is found in the upper respiratory tract, particularly the tonsils and nasal cavities, and the genital and alimentary tracts of pigs. Clinical infections are seen mainly in weaners or growing pigs and less frequently in suckling piglets. S suis has been isolated from a wide range of animal species, eg, cattle, sheep, goats, horses, and birds, as well as humans. Its presence in the environment is transitory. In the western world, most cases are due to occupational exposure (abattoir workers, butchers, pig breeders) while in Asia, the consumption of raw pig products is often the source of infection (cite EID Journal Epidemiology, Clinical Manifestations, and Outcomes of Streptococcus suis Infection in Humans). (VNA) - From the beginning of the year had 10 people die from Streptococcus suis infection by contact, using pork improperly. Patients infected with Streptococcus suis. "In particular, spring is also the season harvesting festival should take place more pigs. Currently, many places still keep the habit of eating pork and duck spring rolls made ​​from raw pork CHAO. This is very dangerous if infection streptococcal pig, "said North said. Information on the program is shared in the media encounter disease prevention Winter Spring took place on 1/12. According to the Department of Preventive Medicine: From early May to 11/2015, the country recorded 82 new cases, 10 deaths caused by Streptococcus suis. And one week ago, had 2 people hospitalized with Streptococcus suis infection. Although most cases are one-offs, there have been outbreaks reported – notably in China. This from a 2007 Lancet report identifying S. suis as an important emerging pathogen. Streptococcus suis: an emerging zoonotic pathogen. Lun ZR, Wang QP, Chen XG, Li AX, Zhu XQ. Streptococcus suis is a major porcine pathogen worldwide, and can be transmitted to human beings by close contact with sick or carrier pigs. S suis causes meningitis, septicaemia, endocarditis, arthritis, and septic shock in both pigs and human beings, and mortality is high. Human infection with S suis occurs mainly among certain risk groups that have frequent exposure to pigs or pork. Outbreaks of human S suis infection are uncommon, although several outbreaks have occurred in China in recent years. 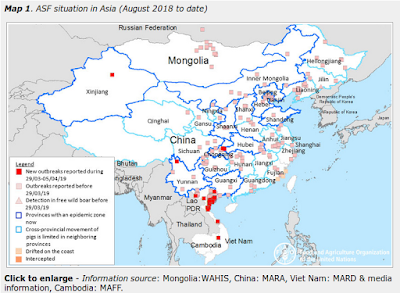 In July, 2005, the largest outbreak of human S suis infection occurred in Sichuan province, China, where 204 people were infected and 38 of them died. There have been 409 cases of human S suis infection worldwide, most of which have occurred in China, Thailand, and the Netherlands, and these infections have led to 73 deaths. More recently, in Frontiers in Microbiology, researchers suggested that S. suis may serve as an important antibiotic resistance reservoir, and may be contributing to the spread of resistance genes to other bacteria (see Streptococcus suis, an Emerging Drug-Resistant Animal and Human Pathogen). While seemingly a minor concern in North America, a study conducted in 2008 at the University of Iowa - by Tara C. Smith (Aetiology Blog) et al. – suggests that this bacterial infection may be more prevalent than we know. Despite numerous cases of human infection with Streptococcus suis worldwide, human disease is rarely diagnosed in North America. We studied 73 swine-exposed and 67 non–swine-exposed US adults for antibodies to S. suis serotype 2. Serologic data suggest that human infection with S. suis occurs more frequently than currently documented. The authors provide two reasons why this bacterial infection may be going under reported in North America. One possibility is under diagnosis or misdiagnosis, rather than a true absence of the disease. A second possibility is that S. suis strains colonizing swine in the United States may be less virulent than Asian strains and therefore unlikely to cause overt human disease even when transferred between species. One need only note that we’ve seen the arrival of new strains of PEDV (Porcine Epidemic Diarrhea Virus) arrive in the United States over the past couple of years with a high nucleotide identity with Chinese strain AH2012. Oceans and vast distances are no longer barriers to the spread of infectious diseases in the 21st century. With the Tết celebrations set for early February, and already concerns over both H5N1 and H5N6 in Vietnam and H7N9 in neighboring China, the Vietnamese government is ramping up the public health messaging early, in hopes of averting a bigger problem later this winter.